Gluteal Tendinopathy (GT) is defined as moderate to severe disabling pain over the Greater Trochanter (lateral hip pain). It is often referred to as Greater Trochanter Pain Syndrome (GTPS) and was traditionally diagnosed as Trochanteric Bursitis, however, recent research defines non-inflammatory tendinopathy of the gluteus medius(GMed) and/or gluteus minimus (GMin) muscles to be the main source of lateral hip pain. This condition affects both athletes (particularly runners) and less active people. One of four females over 50 years is likely to be affected by GT. GT has significant impacts on the quality of life, with similar symptoms to those of hip OA. It interferes with sleep (side lying) and common weight bearing tasks. Tendon structure and loading capacity are influenced by mechanical loading which triggers physiological responses within the tendon. Under normal conditions, the tendon undergoes a cycle of balanced catabolic and anabolic processes. Changes in loading type, intensity or frequency disrupt this harmony. Eccentric contractions in outer ranges (when the muscle is active and the tendon is lengthening simultaneously) represent the greatest form of loading. Failure to adapt to loading, due to rapid increase in intensity and/or frequency with insufficient recovery time, results in a series of catabolic effects which in turn result in altering tenocyte behaviour, reducing load-bearing capacity and predisposing tendons to injury at relatively low tensile loads. A combination of both tensile loading and compression are found to be more damaging than either alone. 1- Joint position: the Iliotibial Band (ITB) presents a compressive force on gluteal tendons that magnifies as the hip moves into further adduction. Birnbaum et al. 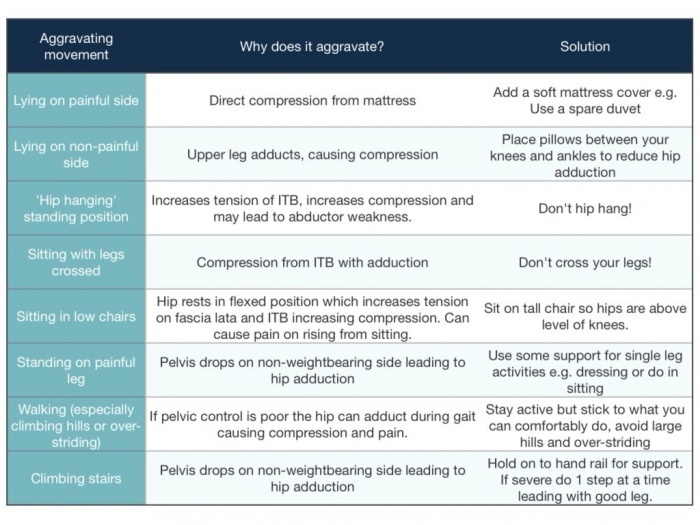 reported a change from 4 to 106 N ITB compression as the angle of hip adduction increased from 0 to 40 degrees. Adopting a constant or a repetitive hip adduction during static and dynamic tasks possibly contribute to the development of GT. excessive lateral pelvic tilt or shift during dynamic single leg loading tasks. ITB tension also exert loads on GMed and GMin tendons at higher degrees of flexion through the fascial confluence of the ITB with the gluteal fascia . These findings suggest that combining adduction and flexion, such as in sitting with the knee crossed or adducted, further increases the exerted ITB tension, thus worsens the condition. 2-Muscle Force: an imbalance in controlling frontal plane movement between the trochanteric abductors (GMed and GMin) and the ITB-tensioners (upper abducting portion of gluteus maximus (UGM), tensor fascia lata (TFL) and vastus lateralis (VL) was observed in patients with GT. Suggesting an altered biomechanical force distribution and abnormal mechanical loading on gluteal tendons, however, further studies are needed to confirm this hypothesis. 3-Bony Factors: a biomechanical study using cadaveric modelling showed increased compressive force associated with reduced femoral neck angle. Another study related the severity of GT to lower femoral neck-shaft angle compared with pain-free subjects with hip OA. Lower neck-shaft angle is likely to contribute to greater offset (the difference between the width of the iliac wings and that of the greater trochanters). All these bony factors are suggested to influence ITB compression against gluteal tendons. Females are more likely to develop GT. A study concluded that females, in general, tend to have a relatively smaller GMed insertion on the femur along with shorter moment arm resulting in reduced mechanical efficiency, particularly significant in those with smaller femoral neck shaft angle. Lateral hip pain caused by tendinopathy may be challenging to diagnose because of the long list of referred pain possibilities. Pain is the main characteristic of GT, frequently insidious, gradually worsens with time and with different loads and tasks. The pain might be significant after a strong guarding contraction of the adductors during a slip or fall. It gets worse at night and sleeping on the affected side worsens the symptoms, affecting the quality of sleeping. Assessing functional limitation and levels of discomfort is important. Patients usually report pain with single-loading tasks such as walking and stairs negotiation. Tasks that require active hip extension, such as sit to stand, are also accompanied with pain and stiffness. The latter is a mutual feature between GT and hip OA, however, patients with OA usually have difficulties manipulating shoes and socks (hip flexion) but this problem is not relevant with GT. Hip FADER from supine position: therapist passively takes the limb into 90° hip flexion, adduction and external rotation to end of range (FADER=Flexion/Adduction/External Rotation). This test aims to position the ITB over the greater trochanter, and positions the GMed and GMin tendons under tension with the ITB fascia against the greater trochanter. Test is positive if the patient experienced pain (≥2/10) on the NRS over the lateral hip. The reported specificity and positive predictive value (PPV) of this test are 86.67% and 88.24% respectively when compared with an MRI imaging. Hip FADER with static muscle test (internal rotation) at end of range. Patient actively resists an external rotation force (static internal rotation) in the same FADER position mentioned above. Since all fibers of GMed and GMin are internal rotators at 90° hip flexion, performing static contraction places gluteal tendons under further tension. the test is positive when the symptoms are reproduced. Adding manual resistance to FADER has improved the the sensitivity, specificity, PPV and negative prdictive value (NPV) of both of this test. Passive Hip Adduction in Side Lying (ADD): from side lying position, the lowermost hip and knee flexed 80-90°, and the uppermost leg supported by the examiner with the knee extended, in neutral rotation, and the femur in line with the trunk. The anterior superior iliac spines are aligned vertically in the frontal plane. The examiner passively moves the hip into end range hip adduction with overpressure, while maintaining the pelvis stable with the other hand. This test compresses the lateral insertions of the gluteal tendons, and a positive response is felt over the lateral hip. This is a modification from Ober’s test, that has been shown to have a high specificity (86.67%) and high PPV 83.33%. ADD with resisted isometric abduction (ADD-R) In the end range of the previous test position (ADD test), the participant is asked to push the thigh up, against the resistance of the examiner’s hand at the lateral knee. This further compresses the tendons with pain experienced over the lateral hip. Similar to the FADER test, adding manual resistance has been shown to improve the the sensitivity, specificity, PPV and negative prdictive value (NPV) of both of this test. Single stance assessment for 30 sec (SLS): the participant stands side-on to a wall with one finger touching the wall at shoulder height for balance, then lifts the foot closest to the wall up to 30 seconds. The timer is stopped once the patient reports the development of lateral hip pain then the test should be stopped and considered positive. The time until the pain is reproduced and the pain intensity should be documented. This test has been shown to have a specificity of 100%, sensitivity of 38% and positive predictive value of 100%, indicating that if the test was positive there was an extremely high likelihood that GT was present on MRI. FABER test: Flexion/Abduction/External Rotation. Tension in this test is specific to the anterior portions of the GMed and GMin. The test is positive when pain is experienced over the lateral hip. FABER test has been shown to have a high sensitivity, specificity, positive and negative predictive value (82.9%, 90%, 94.4% and 72% respectively) for differentiating the diagnosis for greater trochanteric pain syndrome from hip osteoarthritis. Palpation over the anterior,lateral or posterosuperior facets of the greater trochanter ( GMed and GMin tendon insertions) bilaterally. Patient is taking a side-lying with the symptomatic side uppermost, hips flexed 60°and knees together. Positive test indicates pain and tenderness. Palpation is reported to have high sensitivity (80%) and accuracy rate (72%), but the lowest specificity (47%). According to a study by Grimaldi et al. positive SLS test is the most significant in diagnosing GT. Pain provocation and reproduction of symptoms by loading abductors are the aims of these tests. Assessing active abduction in a position of hip adduction may be more useful.Further provocation could be elicited by testing the glueal muscles internal rotation function at a 90 degree hip flexion and maximal external rotation. The traditional Trendelenburg test was useful in diagnosing partial and complete abductor tendon tears at advanced stages of the pathology. Pain on palpation of the structures over the greater trochanter is considered a cardinal sign in diagnosing Greater Trochanter Pain Syndrome. If the direct compression over this area failed to elicit pain then GT may be excluded and other conditions would be considered. The available literature has not yet provided a clear combination of diagnostic tests to confirm GT diagnosis. Further research is required to reach accurate and objective set of criteria and/or tests. The Victorian Institute of Sport Assessment-Gluteal tendon (VISA-G) can be used to assess and track pain intensity and functional limitation. Cook and Purdam suggest functional loading tests to assess and track a tendon's response to therapy. Reduced pain on single leg standing and hopping indicates improved loading tolerance of the gluteal tendons. Longer standing time on one leg or increased number of hops to onset of pain reflect improvement. Inadequate eccentric pelvic control in single leg loading tasks indicates a greater hip adduction moment arm and possible gluteal tendons compression. Video analysis of is suggested for athletes to observe pelvic tilt and femoral adduction in running and changing direction. Imaging could be indicated, particularly if there was trauma involved, to exclude sever injury, fracture or other sinister pathology. Ultrasound is superior to MRI in diagnosing bursae, however, MRI is the gold standard in distinguishing GT from other abnormalities. Positive palpation, confirmed GT on MRI and at least one positive physical test confirm GT diagnosis. However the combinatioin of several tests is advisable because one positive clinical test helps in confirming diagnosis but doesn't necessarily refute it. Misdiagnosing GT as referred lumbar pain or hip OA is clinically common and would lead to delayed intervention and complicate the pathology. Tendon reloading principles are suggested in managing tendinopathies in general . See Tendon Rehabilitation. There are specific consideration when attempting to address GT. Education and training on obtaining optimal biomechanical positions and avoidance of provocative positions such as prolonged seating, sitting on low seat, crossed knee sitting, hanging on hip and sustained hip adduction positions. As in the management of other tendinopathies, stretching should be avoided as it combines strong passive tensile loads. 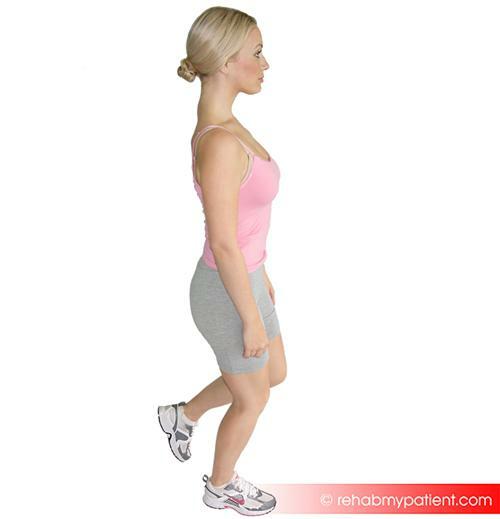 Therefore, Patients with GT should avoid hip adduction stretches either from flexed or extended hip. Massage and dry needling could replace stretching for pain management, however, strong ITB release could be pain provocative. Night pain is a significant issue in GT patients. Teaching patients on using alternative postures such as supine or using a pillow under the knees to unload the anterolateral hip. Using an eggshell mattress with pillows between knees and shin reduces the compression on lateral hip. Load management also includes correcting movement patterns in functional and sports-related activities. Also, recreational and sports modifications, either by avoiding aggravating activities, such as, high tempo, hill running, and plyometric drills, in the short term or by altering exercise volume. Tensile loading program aiming to reduce pain and improving tendon loading capacity. Combined strengthening and functional exercises to optimise movement control patterns and obtain pelvic control. Isometric exercises exhibit an analgesic effect due to activation of segmental and extra-segmental descending pain inhibitory pathway, therefore they are used for pain management. Low load, low velocity isometric hip abduction may be performed side-lying, supine and standing positions for multidirectional training. Exercise should then progress to low velocity, high tensile loading to achieve gluteal tendons hypertrophy. Concentric-eccentric hip abductor exercises through mid to inner range of abduction allow for high tensile loading with minimal compression. Because this cannot be fully achieved in single-leg loading exercises, gradual and monitored progression are required with enough time between exercise sessions for recovery. The overall hip abductors strength is not strongly correlated with hip adduction angle during functional tasks, therefore specific movement retraining in the frontal plane should be incorporated in GT management. Feedback on reducing hip adduction moment during running can significantly reduce hip adduction and contralateral pelvic drop during running. We should also identify associated mechanical dysfunctions in surrounding joints; lumbar, hip and knee and address them to correct the loading patterns on gluteal tendons. A randomised clinical trial by Mellor et al. compared the effectiveness of load management education plus exercise with corticosteroid injection and a ''wait-and see'' approach. Education and exercise resulted in 77.3% success rate on the global rating of change and hip pain intensity on both short and long terms. The Mellor et al. study  also called the LEAP study, included education, load management and an exercise program. The participants received 14 physiotherapy sessions over 8 weeks and had to follow a daily exercise program that progressed the difficulty over 4-6 weeks to allow muscle strength and function improvement while limiting pain aggravation and was dependent on the response to loading. Motoring load appropriately is recommended by increasing load gradually without pain aggravation, particularly night pain. Slow and heavy loading similar to tendon rehab by cook, but it isn't an eccentric only approach. VAS during activity. Symptom response over next 24-48 hours and pain during tendon load tests. In this study they accepted 5/10 pain during the exercise as long as it decreased after the exercise and the patient had no increase in pain during the night or the next morning. Loading was increased depending on the response to the exercises. The home exercises (found here) in the LEAP study focused on hip strengthening (mainly abductors), functional retraining and adduction control during functional tasks. Bridging variations, squatting and lunges were used for functional Loading progressions and pelvic control training. It is important to integrate functional exercises at different positions to optimize the motor control. To load abductors in frontal plane, subjects in exercise group performed different abduction exercises against spring resistance. Static Hip Abduction: ''Imaginary splits'' This exercise aims to activate deep gluteal muscles. Superficial muscles should be relaxed and soft, if you're unable to relax them you may stand with your back leaning slightly on a wall. Bridging: Lie on your back with your knees bent and your feet flat on the floor. Gently tilt your pelvis, as if you are imprinting your lower back into the floor and lift your hips up into the air, while still holding your pelvis level. Hold in the bridge position before you then lower, keeping your navel drawn in and slowly lowering your spine back down onto the floor one vertebrae at a time. Keep your buttocks tight until your pelvis rests back down on the floor. Single Leg Extension:Start position is lying on the back with the hips raised off the floor and body supported by the upper back and feet, keep the head off the floor with the chin tucked in. Lift one leg and straighten at the knee. Keep the leg aligned with the trunk. Do not let the pelvis sag down to the side. Hold this position, then switch legs without lowering the hips, as long as your form remains perfect, continue on switching over between legs. Advanced techniques include placing the arms overhead and the heels further from the body when commencing the exercise. Double Leg Squat: Stand with your feet shoulder-width apart. Engage your core muscles and gently squat down, do not allow your knees to travel too far forwards and keep your weight on your heels, not your toes. Tense your bottom muscles at the bottom of the squat and keep them tense as you straighten back up to the start position. As you squat, bend from your hips and keep your back straight. Side Steps: Stand up straight with your feet hips width apart. Step one leg to the side, then bring the other one to join it. Repeat this movement, continuing in the same direction. Once you have reached one end, stay facing the same direction, but step back the other way, repeating the sequence. Make sure you keep your gaze straight ahead and your body up tall. Following the LEAP study, Ganderton et al. compared gluteal Loading to sham Exercises on pain and dysfunction in women with GTPS. the study found differences in symptoms but no significant differences in hip abductor muscle torque was found between the two groups. Although the study had several limitations regarding the utilised exercise program the psychological factors were highlighted. Pain and limitation severity were associated with higher pain catastrophising, pain self-efficacy and depression scores. Fear and uncertainty are associated with Achilles and gluteal tendinopathies. Kinesiophobia is also a key factor influencing Achilles tendon recovery. These findings support the need for utilising a bio-psychological management approach by addressing patients' concerns on returning to the basic level of activities, helping them identifying their barriers to recovery, exercise empathy, explaining tendinopathy in a positive way and knowing when to refer to other specialised healthcare professional. Corticosteroid injections provide an analgesic effect, yet the pain doesn't resolve completely and and often recurs. Corticosteroids exhibit non-inflammatory effects and GT is reported to be a degenerative condition rather than inflammatory. The pain relieving effect following corticosteroids might interfere with the tendon capacity to respond appropriately to loading. Surgery is considered in persistent pain and failed conservative treatment. 90% long-term improvement was reported following GMed tendon repair in 72 patients. Endoscopic repairs provide an accelerated rehabilitation and less invasive approach with reduced rates of post-operative infection, scar tissue formation and pain. Patients with larger tears are not suitable for endoscopic techniques. Removal of trochanteric bursae and ITB release is utilised in patients without gluteal tears. Studies report good to excellent short-medium term outcomes, however, most studies lacked control group and the rationale behind the mechanism of efficacy remains unclear. ↑ 1.00 1.01 1.02 1.03 1.04 1.05 1.06 1.07 1.08 1.09 1.10 1.11 1.12 1.13 Grimaldi A, Mellor R, Hodges P, Bennell K, Wajswelner H, Vicenzino B. Gluteal tendinopathy: a review of mechanisms, assessment and management. Sports Medicine. 2015 Aug 1;45(8):1107-19. ↑ 2.0 2.1 2.2 2.3 2.4 2.5 2.6 2.7 2.8 Mellor, R., Bennell, K., Grimaldi, A., Nicolson, P., Kasza, J., Hodges, P., Wajswelner, H. and Vicenzino, B., 2018. 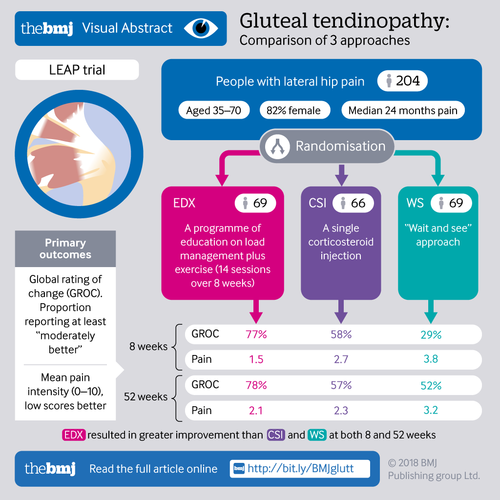 Education plus exercise versus corticosteroid injection use versus a wait and see approach on global outcome and pain from gluteal tendinopathy: prospective, single blinded, randomised clinical trial. bmj, 361, p.k1662. ↑ Almekinders LC, Weinhold PS, Maffulli N. Compression etiology in tendinopathy. Clinics in sports medicine. 2003 Oct 1;22(4):703-10. ↑ Birnbaum K, Siebert CH, Pandorf T, Schopphoff E, Prescher A, Niethard FU. Anatomical and biomechanical investigations of the iliotibial tract. Surgical and Radiologic Anatomy. 2004 Dec 1;26(6):433-46. ↑ Sutter R, Kalberer F, Binkert CA, Graf N, Pfirrmann CW, Gutzeit A. Abductor tendon tears are associated with hypertrophy of the tensor fasciae latae muscle. Skeletal radiology. 2013 May 1;42(5):627-33. ↑ Pfirrmann CW, Notzli HP, Dora C, Hodler J, Zanetti M. Abductor tendons and muscles assessed at MR imaging after total hip arthroplasty in asymptomatic and symptomatic patients. Radiology. 2005 Jun;235(3):969-76. ↑ Birnbaum K, Prescher A, Niethard FU. Hip centralizing forces of the iliotibial tract within various femoral neck angles. Journal of Pediatric Orthopaedics B. 2010 Mar 1;19(2):140-9. ↑ Fearon AM, Stephens S, Cook JL, Smith PN, Neeman T, Cormick W, Scarvell JM. The relationship of femoral neck shaft angle and adiposity to greater trochanteric pain syndrome in women. A case control morphology and anthropometric study. Br J Sports Med. 2012 Sep 1;46(12):888-92. ↑ Woyski D, Olinger A, Wright B. Smaller insertion area and inefficient mechanics of the gluteus medius in females. Surgical and Radiologic Anatomy. 2013 Oct 1;35(8):713-9. ↑ Lequesne M. From “periarthritis” to hip “rotator cuff” tears. Trochanteric tendinobursitis. Joint Bone Spine. 2006;4(73):344-8. ↑ Connell DA, Bass C, Sykes CJ, Young D, Edwards E. Sonographic evaluation of gluteus medius and minimus tendinopathy. European radiology. 2003 Jun 1;13(6):1339-47. ↑ 13.0 13.1 13.2 13.3 13.4 13.5 13.6 13.7 Grimaldi A, Mellor R, Nicolson P, Hodges P, Bennell K, Vicenzino B. Utility of clinical tests to diagnose MRI-confirmed gluteal tendinopathy in patients presenting with lateral hip pain. Br J Sports Med. 2016 Sep 15:bjsports-2016. ↑ Fearon AM, Scarvell JM, Neeman T, Cook JL, Cormick W, Smith PN. Greater trochanteric pain syndrome: defining the clinical syndrome. Br J Sports Med. 2013 Jul 1;47(10):649-53. ↑ Bird PA, Oakley SP, Shnier R, Kirkham BW. Prospective evaluation of magnetic resonance imaging and physical examination findings in patients with greater trochanteric pain syndrome. Arthritis & Rheumatism: Official Journal of the American College of Rheumatology. 2001 Sep;44(9):2138-45. ↑ 22.0 22.1 Ganderton C, Semciw A, Cook J, Moreira E, Pizzari T. Gluteal Loading Versus Sham Exercises to Improve Pain and Dysfunction in Postmenopausal Women with Greater Trochanteric Pain Syndrome: A Randomized Controlled Trial. Journal of Women's Health. 2018 May 1. ↑ Cook JL, Purdam CR. 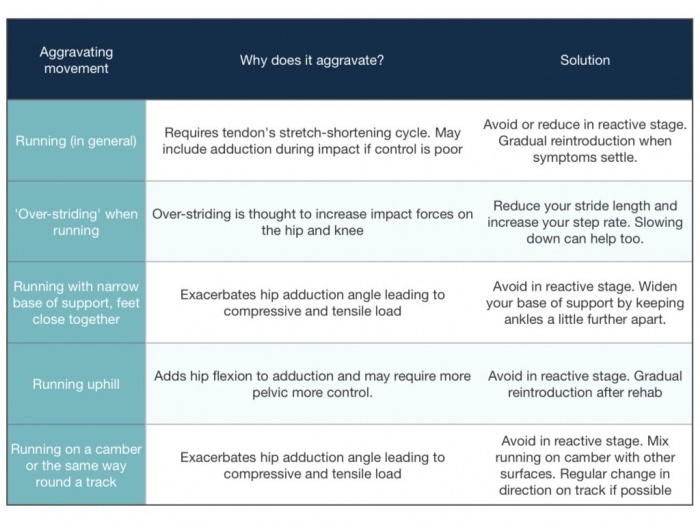 The challenge of managing tendinopathy in competing athletes. Br J Sports Med. 2013 May 9:bjsports-2012. ↑ Kong A, Van der Vliet A, Zadow S. MRI and US of gluteal tendinopathy in greater trochanteric pain syndrome. European radiology. 2007 Jul 1;17(7):1772-83. ↑ Beyer R, Kongsgaard M, Hougs Kjær B, Øhlenschlæger T, Kjær M, Magnusson SP. Heavy slow resistance versus eccentric training as treatment for Achilles tendinopathy: a randomized controlled trial. The American journal of sports medicine. 2015 Jul;43(7):1704-11. ↑ Grimaldi A, Fearon A. Gluteal tendinopathy: Pathomechanics and implications for assessment and management. J Orthop Sports Phys Ther. 2015;45:910-22. ↑ Mc Auliffe S, Synott A, Casey H, Mc Creesh K, Purtill H, O'Sullivan K. Beyond the tendon: Experiences and perceptions of people with persistent Achilles tendinopathy. Musculoskeletal Science and Practice. 2017 Jun 1;29:108-14. ↑ Plinsinga ML, Coombes BK, Mellor R, Nicolson P, Grimaldi A, Hodges P, Bennell K, Vicenzino B. Psychological factors not strength deficits are associated with severity of gluteal tendinopathy: A cross‐sectional study. European Journal of Pain. 2018 Jul. ↑ Silbernagel KG, Brorsson A, Lundberg M. The majority of patients with Achilles tendinopathy recover fully when treated with exercise alone: a 5-year follow-up. The American journal of sports medicine. 2011 Mar;39(3):607-13. ↑ Coombes BK, Bisset L, Vicenzino B. Thermal hyperalgesia distinguishes those with severe pain and disability in unilateral lateral epicondylalgia. The Clinical journal of pain. 2012 Sep 1;28(7):595-601. ↑ Coombes BK, Bisset L, Brooks P, Khan A, Vicenzino B. Effect of corticosteroid injection, physiotherapy, or both on clinical outcomes in patients with unilateral lateral epicondylalgia: a randomized controlled trial. Jama. 2013 Feb 6;309(5):461-9. ↑ Walsh MJ, Walton JR, Walsh NA. Surgical repair of the gluteal tendons: a report of 72 cases. The Journal of arthroplasty. 2011 Dec 1;26(8):1514-9. ↑ Craig RA, Gwynne Jones DP, Oakley AP, Dunbar JD. Iliotibial band Z‐lengthening for refractory trochanteric bursitis (greater trochanteric pain syndrome). ANZ journal of surgery. 2007 Nov;77(11):996-8.